Dan has previously worked as a Front-End Engineer at Microsoft. One of the major features introduced by ES2015 is a whole new scope. In this section, we’re going to start by learning what a scope is. We’ll then move on to look at how we can create the new type of scope, and the benefits it can bring to our code. What the direction of the look-up through the scope chain means for the above example is that innerVariable1 can only be accessed inside the globalFunction1 function, and innerVariable2 can only be accessed inside the globalFunction2 function. 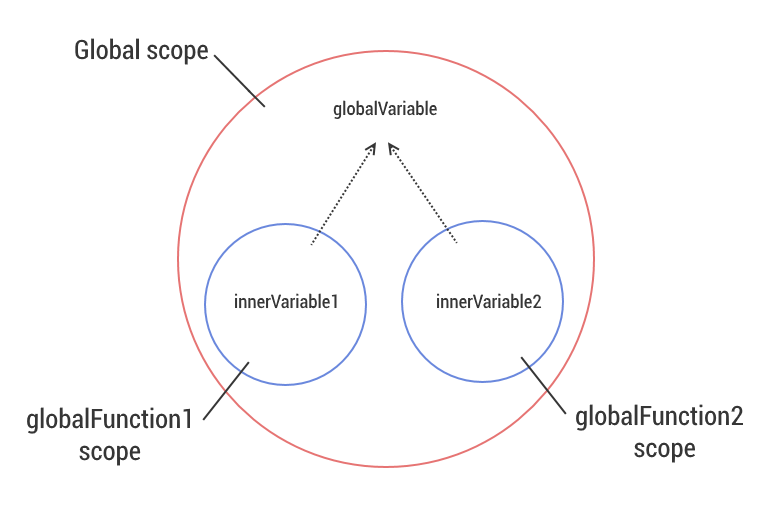 innerVariable1 cannot be accessed within the globalFunction2 function, or by the global scope, and innerVariable2 cannot be accessed by globalFunction1 or the global scope. 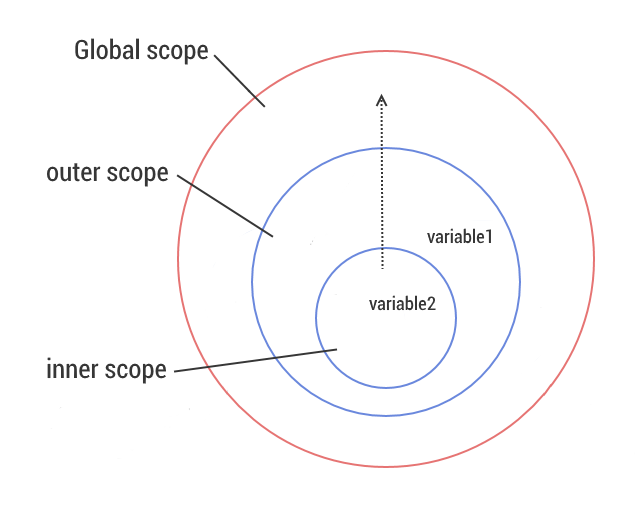 The global scope contains the globalVariable as well as the two nested function scopes. Each nested function scope contains its own variable, but these variables are not accessible to the global scope. The dotted lines represent the direction of the look-up through the scope chain. In this code, we have an outer function named outer, which is defined in the global scope. As it’s a function, it creates a function scope which is nested within the global scope. Inside this scope we declare the variable variable1 and a new function called inner. As inner is also a function, a new scope is created, and nested within the outer function’s scope. Function scopes may be nested within other function scopes, but the same rules around the scope-chain look-up apply, so the inner scope can access both variable1 and variable2, but the outer scope can only access variable1. The scope chain is longer in this example, stretching from the inner function, through the outer function, and up to the global window object. The var statement is not able to create a block scope, even when used within a block, so the console.log statement is able to access both the x and y variables. The fn function creates a function scope and both the x and y variables are accessible via the scope chain within that scope. Only the variable declaration is hoisted to the top of its scope; the variable assignment still occurs at the place where we assigned the value, inside the if statement in this example. Of course, our variables aren’t literally moved around in our code, but the engine behaves as if this is what happens, so this is a useful device for understanding our code better. The declaration of innerFn is also moved to the top of its scope. But remember, it is just the declaration of the function that is hoisted, not the invocation of the function. The above code won’t throw any errors because innerFn isn’t invoked until after the x and y variables have had values assigned to them. Even when using ES2015, the var statement does not create block scope. In order to create block scope, we need to use either the let or const statements inside a block. We’ll come back to const shortly. For now, let’s focus on let. In this case the code throws a reference error; let’s explore why. The fn function creates a new scope within which variable1 is declared. We then have an if statement, which uses a block to declare variable2. However, because we used the let statement within that block, a new block scope is created within the fn scope. If the console.log statement had been inside the if block as well, it would be in the same scope as variable2 and would be able to use the scope chain to find variable1. But because console.log is in the outer fn scope, it can’t access variable2, so it throws a reference error. Block scopes work the same as function scopes work, but they are created for blocks, rather than functions. This behavior prevents a ReferenceError from being thrown. The TDZ was designed like this in order to make development easier—trying to reference a variable that has not been declared yet is more commonly an error than an intentional decision, so the error highlights this to us immediately. As with other programming languages, constants are useful for holding values that we do not expect to change over the life of our program. While the value of a const variable cannot be changed with reassignment, const variables are not completely immutable. If we initialize a const variable with an object or an array, we will still be able to set the properties of the object and add and remove items to the array. Use let to initialize the counter variable for a for loop. Great article! One small quesiton- If “variables declared with let are hoisted, but crucially, they are not automatically initialised with the value undefined”, then why this throw error? Best explaination. This is what I am looking for. Love your blog, Keep it up. Your way of writing and the content you put in your articles is awesome. Saw the new article after a long time. Please continue with your articles….. Thanks sir, Great Article, hope to see more article in future. Hey Dan, love the blog, but I think you need a better syntax highlighter. It’s hard to read some of the code samples. it can’t access variable2, so it throws a reference error.